Fortunately, along with the explosion of online books, there has also been an explosion of apps and programs that enable quick and easy digitization of your most important resources. That means anyone who owns a print reference can create their own digital copy of a book’s index, making the index searchable. The result? Quicker and more reliable references for you, since many indexes list words, phrases, and terms under more than one entry or heading. Create a digital copy of the book’s index with a scanner or smartphone. Convert it to searchable text using an app or software. Store the searchable index for easy reference. There are multiple apps and programs that could accomplish these steps, but I will limit this article to the two methods with which I am most familiar. The steps and descriptions below are by no means exhaustive. There are too many possible combinations of phones, operating systems and software/app versions to write a complete, step-by-step guide to digitizing an index. Please use these ideas as a jumping off point for your own unique combination of software and hardware. Collecting and storing information within Evernote is flexible and robust. It can be used to hold and search reference materials, client preferences, and much more for business or personal use. The notes you create and collect can be accessed on your computer, tablet or phone. With their premium service, you can scan or snap a smartphone photo of a reference index and then convert it to searchable text. I prefer using my phone with Evernote because it works best with larger books that won’t behave when asked to sit still on a scanner bed. Once you’ve imported the images for your book’s index, open the PDF inside Evernote. 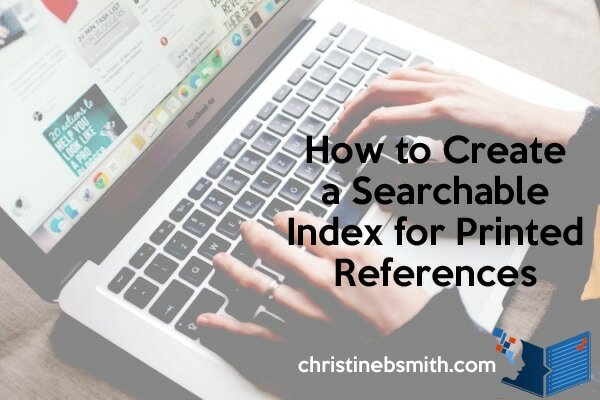 From there, you’ll be able to use the search function to find anything printed in the index. In addition, can you type in your own notes and citations for your index to help you look up situations that seem to keep coming up. This phone app is available for Android and iOS. It is exceedingly easy to use, flattens images, and stores them online for you. You can access your files with your computer, phone, or tablet. Snap photos of your book’s index from inside the phone app to start. The app works best with bright light without harsh shadows. To convert to searchable text, you will need the premium version. If you digitize all your reference indexes in a weekend or within a month, you only need to get the premium version for a month. If you’re really quick, you can use the free trial to scan and convert at no cost. Don't forget to cancel the free trial, though! Once you’ve scanned your indexes and run them through OCR in the app, store them on your computer and open the PDFs in Acrobat Reader. Use the search function to look up a term, rule or citation as you need it. Then just open to the appropriate page in the printed book. To digitize your reference indexes, you may certainly choose to use other apps or programs. The main things you need are: a way to scan/photograph the index, an OCR function (converts the image to text), and a place to keep the converted scan. Whatever works for YOU is the best system. I help court reporters produce accurate transcripts with skilled proofreading. If you can report it, I can proof it. Contact me to discuss how I can help you save time, ​minimize errors, reduce frustration and avoid burnout.